← Happy Pi(e) Day 2014! …which I made into a pie! That’s a pretty-looking cocoa almond crust! For the filling, component #1: melted Mexican chocolate base with almond butter, butter (or coconut oil), and chili pepper powder for some kick. If you can’t find Mexican chocolate, you can add a teaspoon or more of cinnamon. I bet you could also use a couple of these Spicy Maya Bars (one of my favorite chocolate bars) from San Diego-based Chuao Chocolatier, voted best chocolate in the US by Food & Wine. This is another component of the chocolate filling, whipped egg yolks and a bit of natural cane sugar with some vanilla and spiced whisky (for some more kick, but it’s optional). In yesterday’s post, I mentioned that I accidentally used double the amount of eggs, so don’t be alarmed if you make this and my filling looks slightly different. Then also some whipped egg whites as the 3rd component of the chocolate filling. 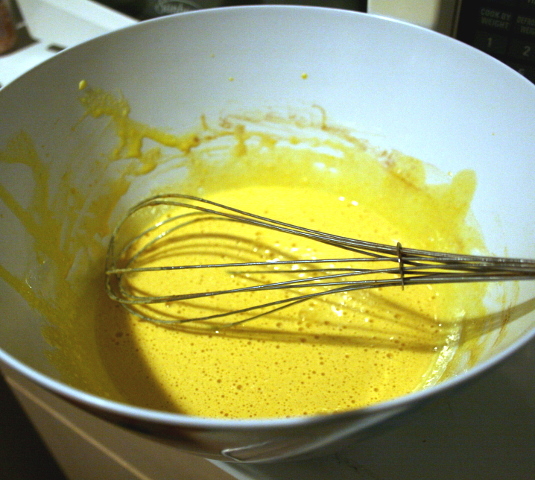 Mix the first 2 components together and gently fold in with 3rd component, the egg whites. 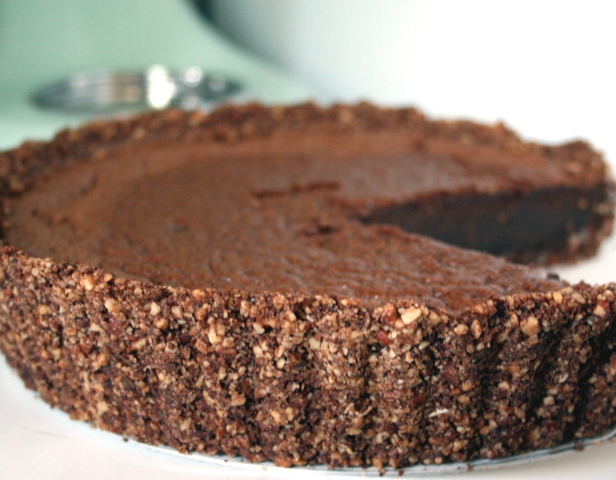 Pour the silky, light chocolate filing into the prepared nut crust and bake! This time, I coarsely ground the nuts, but you can grind them more finely. While baking the pie, prepare your toppings. 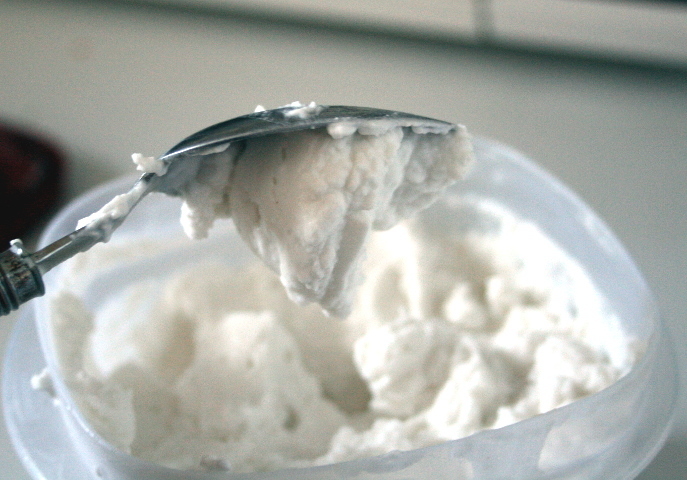 With a bit of stevia, I hand-whipped some full-fat coconut milk (while watching A Young Doctor’s Notebook on Netflix–highly recommended series!). I may have added a splash or more of Spicebox in the coconut milk. Right after the bake. Don’t be worried if it deflates a bit–that’s normal, but you do have to let it cool down for several minutes. Your mouth will thank you. Even though I doubled the eggs, the pie was still luscious, just a bit more spongy than I thought it would be. I suggest going with the original amount of eggs, which I have written in the recipe below. Make the crust: mix together the almonds, salt, cinnamon, sugar, and cocoa in a bowl. Pour in the melted butter and combine. Reserve about 1/4 cup of the nut mixture as a garnish. Press the crumb mixture on the bottom and along the sides of the greased and lined 9-inch pie. Bake crust for 8-10 minutes. Meanwhile, over a double-boiler, melt the chocolate (with cinnamon if needed), butter, and almond butter, stirring occasional. Once melted, set aside to cool. Whisk the yolks with the sugar for about 6 minutes, until light and lemon colored, then whisk in the cayenne powder, vanilla, and spiced whisky. Slowly pour in the chocolate mixture and mix until combined. In a clean bowl, whisk the egg whites until frothy. While whisking, gradually add the cane sugar and keep whisking until soft-peak stage. Gently fold the egg whites into the chocolate-egg mixture until thoroughly combined. Reduce oven temperature to 325 degrees F. Pour the batter into the baked crust and bake for 40-50 minutes. Watch the crust as it may get too toasty before pie is done cooking. Cover the edges with strips of foil or with pie crust guards. Let cool on a wire rack for 10-15 minutes before diving in! Serve with coconut whipped cream, berry sauce, a sprinkle of cinnamon and some of the reserved nuts. How About a Slice of Pie? This entry was posted in Baking, Cooking, Food, Gluten-Free, Holidays, Recipes, Snacks and tagged chocolate, Dessert, Dr. Andrew Weil, Mexican chocolate, Pi Day, Pie. Bookmark the permalink. 🙂 it’s hard to have just one bite! Yum… This looks and sounds quite decadent! Definitely, but it doesn’t make me feel bloated like a rich chocolate dessert can often do. I’m definitely not a ‘health nut’ but totally agree with you on True Food Kitchen having something for everyone. Chocolate, chiles, and whiskey? This is a ‘must try’ for me! That is one beautiful and delicious pie! I love Mexican chocolate, a little spice makes the chocolate exciting!! 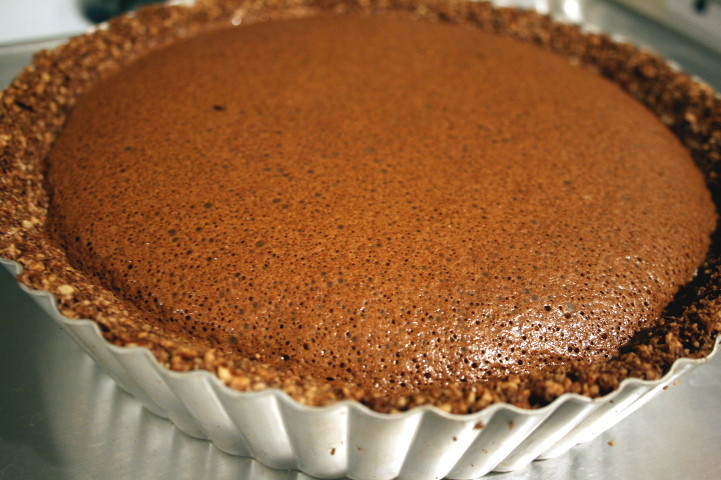 I love things that incorporate spice with chocolate and I LOVE the look of that crust. What a great pie to celebrate with! Thanks 🙂 something different for a crust, though the classic flaky and buttety pastry crust is still my favorite. What a terrific post. Thank you for your hard work in putting this together. Thank you 🙂 Cooking and blogging about it takes time, but it’s fun! Looks yummy 🙂 I am gonna try it !